Opening times: 10.00-12.45, 14.00-17.00 (November-February), 10.00-18.00 (March), 10.00-20.00 (April to September), 10.00-19.00 (October). Time slots are every 15 minutes. Last entrance is 30 minutes prior to closing time. We are comparing Skip the line Leaning Tower of Pisa & Cathedral Prices from leading ticket suppliers and Try to find you Cheap tickets prices on the market. Whether you're spending your holiday in Pisa or only visiting for a few hours you'll probably want to pay a visit to one of Italy's most iconic structures. The Leaning Tower of Pisa draws the attention of thousands of visitors every year, so naturally, queues to this extra special bell tower can be pretty lengthy. That's where your skip the line priority entrance ticket comes in handy, with this very reasonably priced ticket you'll be able to glide to the front of the line at your selected time slot and start climbing immediately. No time wasting and no hassle, just bring your printed or electronic voucher directly to the entrance and get started on those stairs! This is a self-guided tour so take as long as you like to admire the views and pay a visit to the Basilica de Santa Maria Assunta later at a time that suits you. This is ideal for people with limited time in the city or simply don't like wasting their vacation waiting in long lines. The skip the line ticket does not include a guide, therefore this is aimed at visitors who prefer to travel at their own pace. Your Experience With Skip the line Leaning Tower of Pisa & Cathedral? Save your precious holiday time by skipping the long lines to enter the famous leaning tower of Pisa. climb the spiral stone staircase for a breath-taking cityscape and birds-eye-view of Piazza del Duomo. Visit the tower and famous cathedral at a time of your choosing and enjoy the benefits of a flexible self-guided tour. What Skip the line Leaning Tower of Pisa & Cathedral Includes? Reserved skip the line entry to the Leaning Tower of Pisa. Entrance to the Cathedral of Santa Maria de la Assunta. To make the most of your time in Pisa see what other Pisa Attractions are available in the city and plan your trip in advance. 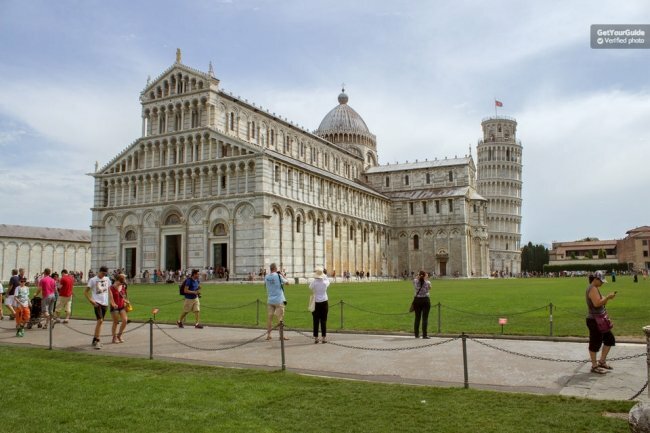 Travelers Reviews about Skip the line Leaning Tower of Pisa & Cathedral? This is one of Pisa's most popular and highly rated tickets, with over 1,000 reviews from Get Your Guide users who have given the attraction a 4.6 out of 5-star rating. While this is a very touristy attraction, travellers say that the view from the bell tower is sensational and most comments agree that this tour is well worth the time and money. This tour has also received 5-star reviews on Tiqets.com. Mobile or printed tickets will be accepted, you will receive your voucher via email. Cancellation policies depend on your supplies: Viator require at least 7 days' notice to issue a full refund, Get Your Guide require 24 hours' notice, and tickets purchased through Tiqets.com are non-refundable. Your skip the line entrance ticket is for your reserved time slot only, if you arrive late then you may not be allowed to enter and a refund will not be issued. Anyone planning to visit the Cathedral should be dressed appropriately, with clothing which covers the shoulders and the knees. Children under the age of 8 are not allowed to climb the tower, children under 18 should be with an adult. Meeting Point: Leaning Tower entrance, Piazza del Duomo.